You have arrived! Located only 15 minutes from the Ixtapa/Zihuatanejo Airport, our deluxe condo is situated high above the white-sand La Ropa Beach on the Bay of Zihuatanejo (land of women). Casa de Serenidad, our 1300 sq. ft. casa has two master bedrooms with private baths, a covered terrace, and views of the Pacific Ocean from all rooms in the house. Located just a short walk to the beach and a quick and cheap taxi ride, bus, or walk to town, we are the authentically designed gated community La Casa Que Ve al Mar (the house that looks out to the sea). A premier 39 unit resort, created by renowned architect Enrique Zozoya who is known for the exclusive La Casa Que Canta,we are a non-commercial vacation destination, combining comfort, privacy and fantastic amenities! Grandly sitting high on the hillside, the gently blowing ocean breezes and views of the blue Pacific will soothe your soul. Our Casa de Serenidad is a contemporary condominium featuring modern amenities located on the 2nd floor with an elevator and ramp for easy access. Beautifully designed, the condo is artfully decorated with native Mexican art & pottery, hand-loomed fabrics, handcrafted cabinetry and tropical beach rattan furnishings. The sand blasted marble floors with intricate inlaid stone designs, walls textured with authentic “grass” and hand-polished plaster walls creates the serene setting for your next vacation. We hope you’ll enjoy our favorite place in the entire condo where the hammock hangs below the Mexican tile roofed terrace, a perfect spot for siestas and sunset cocktails. Prepared with your needs in mind, everything has been supplied for your comfort including premium linens, comfortable queen-size mattresses, hair dryers, quiet, cool air conditioning, a fully equipped kitchen (pots/pans/blender/juicer/baking dishes - we have it all! )with high back Mexican style bar seating or dining al fresco on the view terrace. Enjoy all of the comforts of home, with none of the stress. Use our in-house washer/dryer, maid service two times each week (or more as you wish), and meal preparation upon request. Satellite TV on the 37” flat screen offers a good selection of English speaking channels. We have a good supply of DVD’s, and don’t forget your iPod for the docking station. The condo has free Wi-Fi internet access and purified water. Casa Que Ve al Mar’s two infinity swimming pools come alive for glistening sunsets, when friendly guests share cocktails as they watch the sun drop over the Pacific Ocean. This small, classy resort has it all…lush tropical landscaping, on-site parking, 24/7 gated security and on-site English/Spanish speaking management. We are ideally located next to the charming fishing village of Zihuatanejo, just 15 minutes from the upscale vacation destination of Ixtapa. A perfect day includes a leisurely stroll along fisherman’s walk to El Centro where you can mix with tourists and locals alike. Walk 10 minutes for a beachside massage, to rent a kayak, parasail or to play in the sand and surf at La Ropa Beach. For an evening out, stroll to one of the 5 star dining establishments or locally owned beach spots, or if you prefer dining in, stock your kitchen and bar from the colorful Mercado (open-air market) or from one of the two modern super markets nearby. Taxi service is readily available with bargain price door-to door service. The local bus stops just steps away and is a fast, cheap and a flavorful way to get around! The condo provides ample room for four people. Rates vary according to season. See the rate chart below and calendar for available times. Zihuatanejo is very special to us and our goal is to do everything possible to make Zihua a very special place in your heart, too. We love Zihuatanejo and hope that you will, too! For excellent priced All-Inclusive Resort Package located at the Park Royal in Ixtapa, Cuernavaca, or condo style accomodations in Puerto Vallarta please call us or email. Hi! We're Paul & Connie Sorensen. 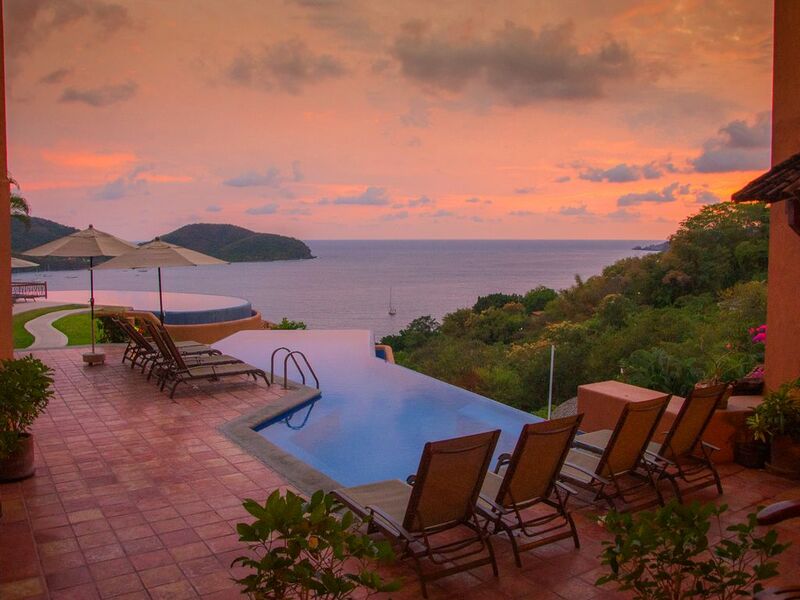 We love Zihuatanejo and spend two months during the winter months. We have been then nearly every month of the year...and love it anytime!!! Something happens to you when you're there. The minute you step off the plane and feel the warm air, see the many smiling faces and you say to yourself, 'I'm home.' That is how it is for us. We completed our purchase in 2006 when it was brick and mortar. Paul, a contractor on Vashon Island, WA, supervised a local contractor to build our dreams in mid 2008. Together we designed the condo interior, shopped in Patzcuarro, Morelia and Zihua for furnishings and by December 2008 we loaded our Mexico car and took a road trip to our new vacation home! It was a great trip and we thoroughly enjoyed creating our Zihua home. We first began visiting Ixtapa/Zihuatanejo in the early 2000's and on our first trip bought a time share. As the years went by, we realized that Zihutanejo felt like home. We have never regretted our decision to purchase a vacation property and each year we feel more and more a part of the community. The condo community is a wonderful group of folks from various backgrounds and the Zihua community is friendly, safe and full of local Mexican culture. We socialize with many of the other owners and renters whom we meet poolside. Chatting poolside, I hear a lot of reasons why guests come back year after year...mostly, they love the people that they meet at the pool. They love how well maintained and beautiful the complex is and they feel safe and well cared for by our staff. The other popular poolside conversation is "What's for dinner?". You will get the scoop about where to get good food! Sundays at Playa Larga is a family affair among the Mexicans and we enjoy being part of that. Weekend nights are fun at the Basketball court in downtown Zihua by the water. There's always a ton of locals out enjoying the evening. La Ropa Beach is always a special treat when we camp out for the day at La Perla. There chairs are the best! I enjoy yoga or a massage at Pati's on La Ropa Beach. We hope you will come to love Zihuatanejo as we do. toilet, shower, Double Rainhead Shower for Two! Walk 2 blocks to Zihua's finest La Ropa Beach! From every room and the terrace! Free local calls in Zihuatanejo, Canada & US. Remote Controlled Air Conditioner (3) one in each bedroom and one in the living area. Quiet & efficient. Sliding Glass Doors to the terrace allow for closing the condo. Many of the condos are 'open air'. In this case, we have the wonderful 'open air' but you may choose to close the glass doors, too! Ice Maker but hard to keep up with the amount of ice one uses! I suggest to also buy a bag of ice. Electric Cook Top with four burners. Many spices, oil, etc. Just depends. Everything you need! Use our micro/convection oven! Purified Water throughout the condo. Dine at our authentic Mexican eating bar inside or al fresco on the view terrace. One Flat Screen TV in the Living Room. Choose from many channels plus many music channells ranging from salsa to classical. There is a lending library at the poolside cabana and some books in the condo. We have many movies to choose from and alway pick up new ones at the mercado. The grounds are filled with tropical plants. Our condo is home to beautiful flowering bougainvillea and breezey palms. Nearby charters for fishing, sunset cruises, snorkeling, sailing. Marina for pleasure boats is located in Ixtapa. Large, Mexican Tiled Terrace with a Great View of Zihuatanejo Bay with Hammock, 2 Sling Back Chairs and Dining al Fresco. Snorkeling Equipment may be rented. Two Incredible Infinity Pools Overlooking Zihua Bay. Each Spectacular Pool has Sun Umbrellas and Chaise Lounge Chairs. Air Conditioning, 2 Master Suites with Queen Beds, Beach Towels, Elevator & Ramp, Inflatable Queen Bed & Two Infinity Edged Pools with Great Sunning Terrace. Maid Service included two times per week (minimum 7 night stay) & more frequently available upon request. Minimum age limit is 10 years old (on a case by case basis). ( there are a few hill to walk up however but great exercise) , Thanks Connie and we'll definitely come back . We stayed here in November and had a wonderful experience. As others have reported, the condo is gorgeous and the view is incredible. You'll feel blessed when you wake up to the view from the master bedroom. There was nothing better than sitting on the patio with a cocktail at the end of the day soaking up the view and feeling the warm, balmy tropical air. You're in for a treat the first time you hear the call of a Chacalaca (local bird) - They have a very unique sound. We loved walking to both La Ropa and Las Gatas beaches. We had fun walking to Las Gatas using the rocky coastal path and then taking the water taxi from there back into town. We rented a car but if you plan on staying in the Zihua area only, I would recommend not renting one. We had no problem walking from the condo to anywhere in La Ropa or central Zihua. The cabs are very inexpensive too so using them several times a day would still be less expensive than renting a car. Everyone in town is very friendly and we always felt safe. Thanks Connie for a wonderful stay - We look forward to returning again! The property is beautiful - the view is stunning. The condo is also beautiful and amazingly furnished and equipped. All communications with the owner before our stay, and the entire staff during our stay, were excellent. We would definitely stay here again, and highly recommend this property. It is quite a climb up from La Ropa beach which we did not mind (must work off the drinks and yummy food somehow), but it is worth mentioning. Must always find a way to work off the yummy food and margaritas! I agree with Christine! We usually take our walks along the beach or to La Madera or town. Everything is so close...then we settle for a taxi ride home! We enjoyed our time here. The condo is beautiful and tastefully decorated. The place shows pride in ownership. We would have enjoyed some nice chaise loungers on the patio. Other than that excellent. We love our terrace and our comfy sling back chairs and hammock. We also love our al fresco dining which also has comfy traditional leather chairs with arms for those who prefer to be more upright. We typically enjoy our terrace in the morning with coffee or at night with a cocktail. You are sheltered from the sun all day until around 5 PM...but that is pool time! Glad you enjoyed your stay! Thank you for the review. As a point of information, both beds are queen sized, though the master bedroom bed was custom made so it is Cal King length for my 6'7" husband. The bed in the second bedroom is a standard queen and is the same size as typical queen sized beds. We have had tall friends sleep there and hadn't had any complaints. The view from the balcony is also enjoyed from the living room and the kitchen where we have an eating bar and certainly from the second bedroom, but only if the privacy doors are open. Again, we are happy you stayed at Casa de Serenidad and thank you for the 4 Star Review! We absolutely loved our stay at Connie and Paul's beautiful place. The condo is comfortable, well equipped and the views are spectacular. We especially loved laying in bed at night and hearing the waves hit the shore, so surprised that we could hear them so well. The condo had everything we could possibly need and is beautiful and a wonderful place to come home to after a day of activites. Whether out exploring, beaching it or relaxing at "home," we were comfortable and relaxed. Eli, the manager, was extremely helpful whenever we had need for a suggestion and once we rented a car, we really got to know Zihua, went to the Commercial whenever we needed something , drove up to take a look at Ixtapa (no comparison to Zihua!) and even south to Barra de Potosi. Everything was perfect! Connie's book of suggestions was so helpful as was her friend Harriet's. Our vacation in Zihuatenejo and, in particular, at Casa de Serenidad was FABULOUS! So glad that we were able to meet you and give you the personal airport pick up service! Always fun! Thank you for choosing Casa de Serenidad to celebrate Lor's big birthday! Saludos! Rates are not confirmed until reservation is accepted.